Much like Dissidia 012 Final Fantasy, the Arcade release of Dissidia: Final Fantasy features costume changes for the playable characters. When Dissidia 012 Final Fantasy launched in 2011, it featured Kingdom Hearts DLC variants for both Cloud and Sephiroth. 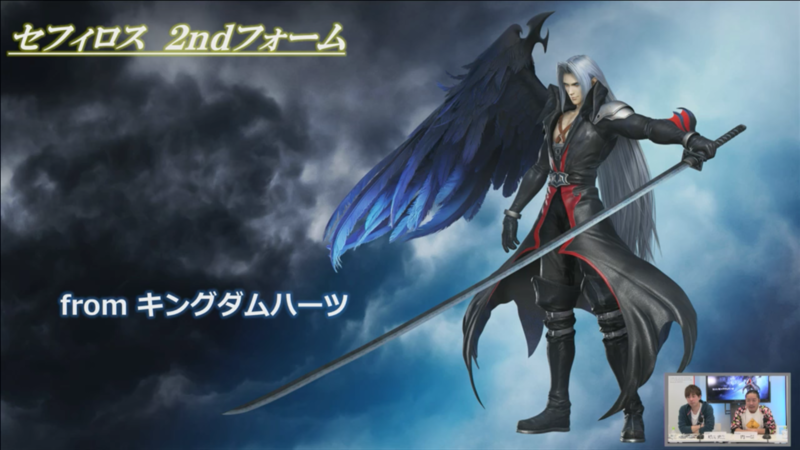 In a livestream held on February 14th 2017 in Japan, Sephiroth's Kingdom Hearts outfit was re-revealed for the arcade version. Maybe the Kingdom Hearts outfit for Cloud will soon be joining the game as well. If you haven't been keeping up with the Dissidia news, Kuja was recently revealed to be coming into the game, the Director and Producer discuss the console version of the game, and Final Fantasy XII's Rabanastre is an upcoming stage. You can view more about Dissidia, and other Final Fantasy games, on our sister site Final Fantasy Network. Hardly related, but it'd be great if Nomura could somehow slip Ramza Beoulve into Kingdom Hearts III somehow. Happy to see it return. I would love to see the return of Cloud and Squalls KH1 outfits. We missed out on Squalls KH outfit in Dissidia 012 in the americas, so id be happy to see it return in Dissidia Arcades console release. And should Aerith return, this time as a playable character, I'd like to see her KHI outfit be usable as well. I used this outfit for him the most while playing Duodecium. Also those wing prongs (?) on the hilt look rather new. You mean the extensions on his lower arms? These were always there in his KH form, in both KH 1 and KH 2. As for the "wings" on the weapon in the video, it is obvious that this isn't Masamune equipped but a different weapon, possibly Sephy's second alternate weapon after "Mako Katana". His KH outfit certainly looks more sophisticated and intimidating compared to his regular one and his standard Dissidia one. If Sephy is included in KH III, I wonder if he will look like this or if his outfit gets some new props again (like the hip-wings in KH 2). This new winged sword (which reminds me a little of Genesis' red rune sword, only black and with a longer blade) looks also pretty imposing. is it just me,or does that Katana look like a black,Katanafied Divewing Keyblade? Ah, I must have forgotten. I don't recall seeing them in Dissidia. They don't seem to appear on his hilt in this render. Cool! I really like Cloud's KH1 design, so would be nice too see it included in other stuff too. Not a fan of the KH2 one. Seph is a great start, but Cloud's KH1-outfit would be bae. You can clearly see the black and red "wing" protruding from his lower arm even in this render. As when speaking about a "hilt", aka meaning the weapon, as said, the weapon Sephiroth wields in the video isn't the Masamune (which is the only weapon he actually visually wielded in the old Dissdias due to technical limitations), but his second alternate weapon. 1. Masamune, his default and signature weapon. The third one is the new weapon that is showcased together with the Kingdom Hearts outfit in the video, and this new weapon apparently does have wings on the hilt forming a sort of handguard. The third one is the new weapon that his showcased together with the Kingdom Hearts outfit in the video, and this new weapon apparently does have wings on the hilt forming a sort of handguard. The new weapon threw me off clearly ;~; The design is pretty awesome.